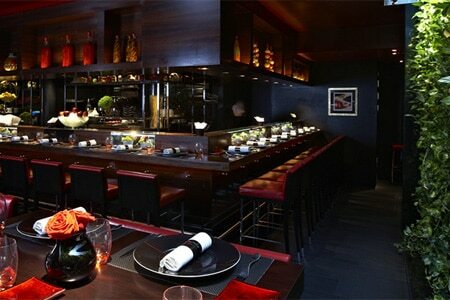 Contemporary French cuisine with Asian accents in a chic red on black environment. WE ARE SAD TO ANNOUNCE THAT CHEF JOEL ROBUCHON PASSED AWAY AUGUST 6, 2018. READ ANDRE GAYOT'S TRIBUTE TO THE CHEF OF THE CENTURY. L'Atelier de Joël Robuchon (also located in Paris, New York, Las Vegas and Tokyo) on West Street has never faltered since it opened in 2006. In the main restaurant, L’Atelier, diners sit on bar stools around a counter facing an open kitchen. Decorated in black granite with a lot of dramatic red, it has a distinctive Japanese feel. There’s also the first floor La Cuisine, with a wood-fired oven, and a jewel-like bar on the third floor. The menus, which are several and complicated, revolve around the concept of a series of tasting plates, tapas-style, with main portions available as well. Dishes are first-rate: chip-shaped foie gras with truffle marinated potato; egg cocotte with wild mushroom cream; the famous Iberian ham with toasted tomato bread. Or you can go the conventional route with main courses of peppered venison with spiced pears confit, celeriac and red cabbage or veal sweetbread with chard and stuffed lettuce leaf. The cooking is masterly; the integral tastes of every ingredient allowed to speak for themselves. Desserts might be chocolate cream with strudel and coffee, or warm yuzu soufflé with vanilla/raspberry sorbet. The wine list is long and mostly expensive though there are bottles around the £25 mark. Cocktails are pricey. Service is as professional as you would expect. Set lunch and pre-theatre dinner 3 courses £38, 4 courses £43; set meals £80-£194.